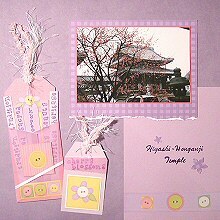 Tags continue to be one of the most popular forms of embellishments in scrapbooking and often just as much effort goes into creating the tag as goes into creating the rest of the page. The following page utilizes a rather simple arrangement to both highlight the photo and prevent overshadowing the complex tag embellishments. This layout was created using Two Busy Moms Misty Violet Wash paper, Paper Garden Lilac Speckle Plaid paper, Pink Vellum, Cardstock (pink, purple and white), white ribbon, white eyelash fibre, pink fibre, purple eyelets, flower punches, purple ink, Alphabet stamps, purple pen and Pebbles Inc Spring Bouquet stickers. Begin with the easier elements of the page. Matt your photo on pink cardstock. I chose pink to highlight the pink cherry blossoms in the photo, but you can select a more neutral colour, such as white or a soft yellow, if you prefer. Keep the border fairly thin as you do not want to draw much attention to it. When you are done, matt your picture again onto your plaid paper. Make this border around 1cm wide, except along the bottom edge. Leave some extra space along the bottom and then carefully tear along the edge. This helps to add a little interest to your page and draw more attention to your photo. Next, cut a rectangle of purple cardstock for the bottom right-hand corner of your page. Use your purple buttons sticker for the width. Once cut, add your title (in my case, the name of the temple). I just use a pen to write the title, but you can use your printer or alphabet stickers if you prefer. I also used my floral punch and plaid paper to decorate my title, but this step is optional. Finally, adhere sticker across the bottom and attach the rectangle to your page. You have now completed the basic elements on your page and it is time to move onto the two tags. Begin with the small tag. Cut a tag from purple cardstock. Matt your chosen sticker on white cardstock and centre it at the bottom of your tag. Punch a hole in the top of the tag and set your eyelet. Due to the fibre, you will not see much of the eyelet, but I suggest using a subtle colour like purple, white or pink to avoid drawing attention to it. Before threading your fibres, twist them together to add interest to your page. Finally, tear a small piece of pink vellum to stretch across the top of your tag. I made mine a little longer than necessary, tucked the ends underneath my tag and adhered them to the back. This avoided any need for vellum adhesive. Finish off your tag by stamping a phrase on the vellum. Be careful when stamping on vellum. It is not a very absorbent material so smudges easily. Make sure you allow plenty of time for the ink to dry before touching it and before placing it inside a page protector. The second tag is a lot more complicated to construct than the first and does require a little patience. I would recommend that this step only be tackled by a more advance scrapper or someone wishing to extend their skills a little. This tag was made using the tag stickers from Pebbles Inc Spring Bouquet stickers as the base. As you can see, it has changed a lot from the basic sticker, but that's one of the great things about Pebbles Inc stickers - they are so versatile! To recreate this, being by cutting the bottom off the tag. Make your cut just above the row of buttons at the bottom of the sticker. Be careful though. You will need this piece later. Once you have removed the bottom piece, adhere your tag to white cardstock and cut out. This step is not essential, but just makes the tag easier to work with. 1. Cut a piece of pink vellum 11.5cm tall by 15cm wide. 2. Adhere your tag on top of the vellum. Make sure it is horizontally centred and 1cm above the bottom edge. You should now have a flap on either side of the tag. 3. Fold the flap on the right over towards the centre of the tag. Make sure you make a crisp fold along the edge of the tag. 4. Fold the flap on the left over towards the centre of the tag. 6. There should still be excess vellum at the bottom. The folds you created should have created a rectangle underneath your tag. Cut out this rectangle and throw away. Try to make the cut as clean as possible. 7. Re-fold the flap on the right towards the centre of the tag. This leaves a flap overhanging at the bottom. Fold this under the tag and adhere to the back. 8. Repeat this step for the left flap. You have now completed your envelope. The next step is to create the strips inside it. To do this, cut multiple strips from purple cardstock. I chose to make five, but you can cut as many as you like and whatever width suits you. Just make sure they are long enough to fill your pocket. Use your alphabet stamps to write a word on each strip. Choose words that are relevant to your layout. For example, I chose four words to reflect what comes to my mind when I think of the temple (tradition, beauty, sacred and heritage) as well as the name of the city (Kyoto) where the temple is located. You will notice that I gave emphasis to 'Kyoto' by placing it in the middle, using a wider strip and writing the text downwards instead of on its side like the others. When you have finished making your strips, arrange them inside your pocket and adhere them. It is now time to seal your pocket. Use your adhesive to glue the flaps down at the bottom and in the middle. You only require a small amount of glue to hold them in place. Make sure you only place your adhesive in areas you know will be covered up by another element. Remember that piece your removed from the bottom of the tag right back at the beginning? Now it is time to use it. Adhere it to the bottom of your tag on top of the vellum. This not only makes a nice embellishment for your tag but helps to keep your pocket sealed. Next, matt your pink square sticker on white cardstock, cut it out without a border and adhere it to the middle of your tag. The cardstock is only being used to give the sticker extra thickness and prevent a fold line developing from the uneven layers underneath it. Place a piece of white ribbon at an angle across the front of your tag, tuck the ends underneath and adhere to the back. To finish off your tag, punch a hole in the top and set your eyelet. Again, I suggest using a subtle colour like purple, white or pink. Twist your fibres together and thread them through the hole and voila...Your second tag is done! You are now ready to finish off your layout by adhering your tags to the bottom left of your page. Congratulations on making it to the end! If you have some photos leftover, combine them with your leftover stickers and turn this into a double-page layout!